Recently, the Rio Texas UMC Conference recognized its member churches who were given window clings from Safe Gatherings to honor their participation in the program. As a valuable partner, Rio Texas is committed to protecting the vulnerable, and we thank them for these efforts. To view the newsletter, click here. 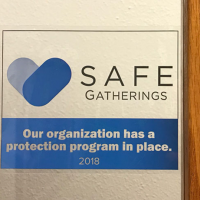 Safe Gatherings is a comprehensive system that incorporates an online application, online abuse prevention training, several levels of background checks, and paperless reference checks for people who volunteer or are employed with churches, schools, and organizations that serve or work with children, youth, and vulnerable adults.